We had so much fun reviewing the Krusty Krab set that we decided to give another of MEGA Blok's SpongeBob SqaurePants sets a go. 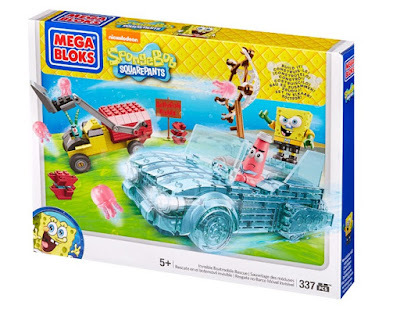 Don you finest Mermaid Man garb and jump into your invisible car, as we review the MEGA Bloks SpongeBob SquarePants Boatmobile Rescue! Crikey, what a mouthful. 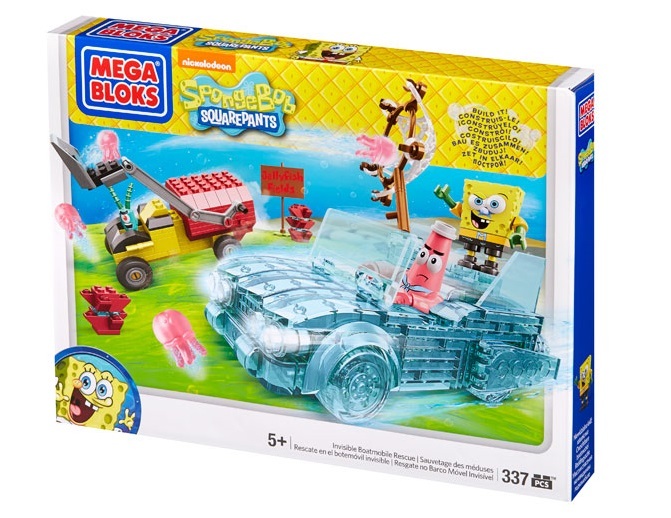 Coming with 337 parts and three (kinda) figures, the MEGA Bloks SpongeBob SquarePants Boatmobile Rescue is comprised of two vehicles, a bit of terrain, and a load of squishy jellyfish. It took us about an hour or so to complete, and thanks to the heavy use of transparent parts, was a fun but tricky build. SpongeBob and Patrick are in full Mermaid Man and Barnacle Boy getup (this set being drawn from an episode in which they take over the super heroes' mantle), while Plankton is simply a single piece character that we've had before in the Krusty Krab set. We totally adore this version of SpongeBob, complete with starfish nose guard, and the fact that all Patrick has on is a tiny pair of pants and a neck scarf is priceless. But is the real reason you'd buy this set. With the exception of the net, the Boatmobile is made from 100% blue transparent parts - even the rubber tyres are transparent! Because of this we found it slightly trickier to put together than we were expecting, as many of the parts look the same in your hand. Still, once complete, the invisible underwater effect is achieved really well. One figure can fit behind the wheel, while another can stand next to the net. It might be difficult to see in the photos, but both the windscreen and rear-wheel speed flaps can be moved about a bit, while the net itself can rotate. Oh, and obviously all four wheels spin, letting you actually roll it around. The net support is made from simple brown parts, but he mesh of the net is pretty special. It is made from a very stretchy rubber-like material, the same stuff from which the included pink jellyfish are made. It can be pulled out to about four times its actual size, but clips on to the net very well. There is a lot of great detail on the Boatmobile; things you'd miss from casually looking at it from afar. The rear has thruster exhausts (using parts we've seen before on MEGA Bloks Halo sets), while there are also grills and head lights on the front - again, all in trans blue. Basically, if you were looking for lots of interesting trans blue parts, this is your set. But why do the lads need a great big net? To catch jellyfish vindictively launched from this thing, of course. Plankton's van is a bit of a weird build as whereas the Boatmobile was complex and interesting, this is overly simplistic and quite poorly executed. This is as simple and as basic as MEGA Bloks gets without drifting into the realm of the toddler sets, and it seems quite out of place here, especially when compared to that Boatmobile build. It reminds us of old LEGO sets from the 1970s; bold colours and simple block-like bricks. It also uses a criminal amount of the set's bricks - about 40% by our reckoning. But, design aspects aside, the arm used to fling the jellyfish actually does work and you can fit it to either side of the truck. 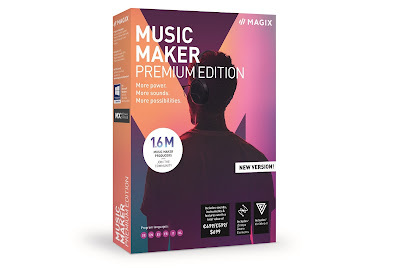 And, as we said, you get all this stuff, too. There are no stickers used in the set (always a good thing) so that Jellyfish Fields sign is a large printed part which we very much like. The coral parts use yet more trans blue pieces to rotate around, creating more organic shapes, while the four jellyfish are just as squishy as the net and rather cute. To be honest, we prefer all of this than Plankton's truck. 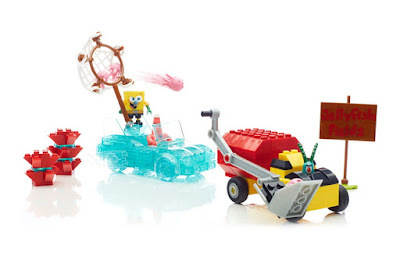 So although this set features quite a bit of filler (use the truck and the terrain for spares, say we) the Boatmobile car is really unique, while the Mermaid Man and Barnacle Biy-ified SpongeBob and Patrick will be highly sought after by collectors. Check it out.